The amount of time a veneer or crown (cap) lasts depends on many different factors, including at-home care, a patient’s commitment to follow-up maintenance visits with the dentist, and the quality of the crown or veneer. We utilize dentistry’s latest technological advancement called Laser Periodontal Therapy. This means we can contour and trim gum tissue easily and comfortably with almost no discomfort. Unlike removing tissue with a scalpel, a laser doesn’t cause bleeding and swelling. Having a comfortable post-operative experience is now the norm. I have a missing tooth. What can you do for me? We provide Bose® QuietComfort® Acoustic Noise Canceling headphones for your relaxed and pleasant dental experience. “The Wand” is a computer-assisted method of delivering local anesthesia. The Wand’s computer produces more comfortable injections; in fact, many injections that were once considered sensitive can now be accomplished with near pain-free precision. If you don’t like needles, ask any of our staff for more details about The Wand. Our doctor subscribes to the latest industry journals to keep tabs on research and development in the dental industry. He/she also takes time on a regular basis for continuing education, and ensures that the staff does the same. As a team and as individuals, our office makes it our responsibility to be familiar with the latest techniques and materials available. 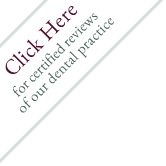 We have a number of ways to improve the look of your front teeth without the use of braces. For slightly crooked or unevenly worn teeth, a bit of reshaping and the addition of porcelain veneers may be sufficient to give them a bright, uniform look. Also, we provide Invisalign removable clear braces for your convinience. Snoring is tough on any relationship! And, since it can be caused by a number of factors, we encourage you to have your spouse come in for a consultation to determine the cause. In some cases, a person may actually stop breathing for short periods during the night – a condition called sleep apnea. In other cases, snoring can be caused by enlarged anatomical structures within the mouth and throat. During sleep, the throat area relaxes, allowing these structures to collapse against one another and obstruct clear airflow. In many situations, we can prescribe and fit a special appliance called a ‘snore-guard’, which gently holds the mouth and throat in an open position to prevent snoring during relaxed sleep. We’ve solved the mystery to comfortable dentistry. If you haven’t been to a dental office in a while, we think you’ll be pleasantly surprised. Today’s dentistry is faster than ever before. All of our staff members are highly trained to make each of your visits as pleasant and as comfortable as possible. We have many options to help you relax here, including needle-neutralizing topical anesthetics. Patients have been so relaxed that they even have fallen asleep in our dental chairs! Our office welcomes most of the major insurance plans. We’re well versed in the latest coverage trends, and are more than happy to discuss the particulars of your plan with you prior to any treatments you may undergo. the doctor’s emergency voice mail access number. We make it a point to always be accessible to our patients of record.